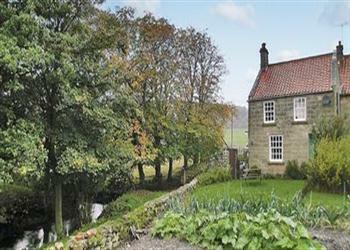 Beckside Cottage in Great Fryupdale, North Yorkshire sleeps 4 people. This charming, Grade II listed, E.T.C. ‘4 Star’ holiday cottage boasts an idyllic, wonderfully tranquil honeypot location in the heart of the North Yorks Moors, enhanced by breathtaking views. Adjoining another property, it lies 3 miles from picturesque Castleton and Danby. The trickle of the meandering stream soothes away the stress of everyday life, and many footpaths can be accessed from the garden via a little wooden bridge. A short drive leads to the bustling port of Whitby and coastal villages of Robin Hoods Bay and Runswick Bay. Spacious living/dining-room with rugs on wooden floor and range with open fire. Modern well-equipped fitted kitchen with ceramic-tiled floor. First floor: Two bedrooms, each with wooden floor and wooden ceiling; one double with countryside views and original cast-iron fire surround, and one twin-bedded. Large bathroom/W.C. with over-bath shower and wooden floor. Do you want to holiday near Beckside Cottage (ILC), you can see other cottages within 25 miles of Beckside Cottage; have a look to find your perfect holiday location.